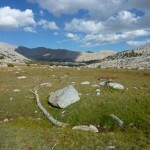 Milestone, Midway, Table, and Thunder (along with Centennial) make up the southern portion of the Great Western Divide, a ridge near the dead-center of the Sierra, far from both east- and west-side trailheads. 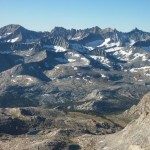 The east-side approach crosses Shepherd Pass (a 6000′ climb), then descends 1500′ to cross the headwaters of the Kern River before taking off cross-country for the peaks. 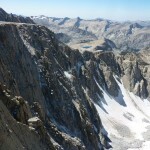 A true traverse is a serious 5th-class endeavor along miles of serrated ridge, but it is possible to go from one to the next without losing more than 1000-1500 feet of elevation. 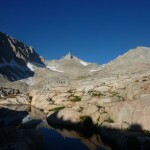 Therefore climbing all four from a base camp near the Kern is a fairly normal day. Climbing them all from the trailhead requires sandwiching this day between two other normal 15 mile backpacking days. 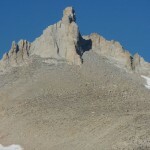 I am invariably lazy when it comes to bagging remote Sierra peaks such as those on the Great Western Divide. 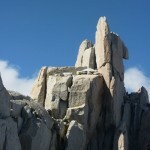 This laziness takes one of two forms: either I avoid climbing them, or I try to hit as many as I can with one approach. Bob has mentioned a few times that I should try to bag Milestone, Midway, and Table — which share an approach — in a day. Leor Pantilat recently mentioned adding Thunder, and I found that Secor outlines a route for tagging all four. Together with a desire not to let my end-of-season fitness go to waste, I had enough motivation to switch to my second mode of laziness. After a few hours’ sleep, my alarm went off for a 1 AM start — my earliest ever. I reset it for an hour later, but was soon reawakened by two especially loud early-morning hikers, leaving their car stereo blaring as they discussed what food to pack and did who-knows-what for twenty minutes. After pretending to sleep until they left, I decided I might as well get going, and started up the trail at 1:20. I caught my tormentors below the Symmes Creek saddle, and found out that they were heading to Williamson. They were not too slow, and had no reason to start so early. I had not been up Shepherd Pass in a few years, and was surprised to actually enjoy myself on the consistent, moderate climb. 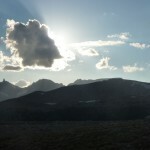 I was pleasantly surprised to reach the pass in 3h10, having expected — for no good reason — to take around 3h30. I took off jogging down the other side, then promptly squandered those 20 minutes trying to shortcut the trail to reach the Kern cutoff. 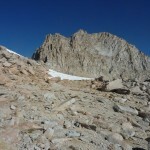 It happened exactly as I feared: after eventually finding a way across Tyndall Creek, I hit the JMT not knowing whether the Kern cutoff was north or south of my position. I headed north for awhile, but suspected I should have headed south. After repeatedly studying my map and heading off cross-country, dawn made it possible for me to fix my position and, heading due south a few hundred yards, pick up the trail. I reached the Kern a bit after 6:30, and took off again cross-country up Milestone Basin, picking up another sadly-abandoned spur trail. I had originally intended to climb Thunder first, but decided it might be smarter to go up the only tricky part of the route, the climb of Table’s southeast face. Refilling my water at a creek, I was surprised to see two campers starting their morning. I decided they probably came to this remote basin for solitude, and did not disturb them. 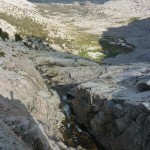 The basin is surprisingly long, but mostly easy travel, either on the old trail or across slabs and grass. Milestone Mountain looks completely inaccessible from the east, but fortunately there is a 3rd class ramp up the back, reached by a talus gully just north of the summit pinnacle. 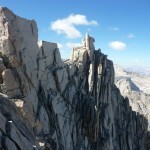 I reached the summit 7h25 out, and sat enjoying views of everything from the Kaweahs, to Whitney, to the Palisades far to the north. Since I expected each additional peak to take less than 2 hours, I thought I was in good shape for time. 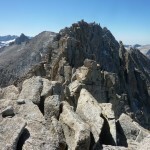 Returning down Milestone’s east face, I traversed around the basin to a notch in Midway’s east ridge, then made my way up the talus of its northeast face. Heading directly up the southeast face is supposedly class 3-4, but it looked complicated, and would not have saved much elevation loss. 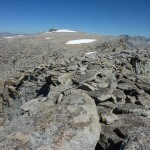 I reached Midway’s summit 8h35 out, still on schedule for a reasonable day. Unlike Milestone and Table, Midway isn’t really a distinctive peak, but it’s just sitting there. After admiring Thunder’s gnarly south ridge, I dropped down the north part of Midway’s northeast face, circled around a tarn, and started up toward Table. I (thought I) had failed to bring a picture of Secor’s route description, but I knew that I should head up the face close to the table part of Table, to avoid the ridge’s serrations. Since I knew the 3rd class route was hard to find even with the description, I hoped I could 4th-class something that worked. The southeast face looks like fun, blocky 3rd class from below, but is in fact wretched, outward-sloping ledges covered with all kinds of loose dirt and rocks. I made my way up and left, eventually following some cracks and dihedrals to the ridge. Only a little way along, I ran into a gap requiring either a desperate leap to a large pedestal or a scary 5th class downclimb. Having signed up for neither, I examined the option of traversing around the west side, but nothing looked promising. I retreated to the east face to look for alternatives, with a sinking feeling that my day might end here, with the face steepening as I headed north. Looking back, I saw a line of flakes and ledges leading up and left to a point farther north on the ridge. Not seeing anything better, I made my way up this class 3-4 line to the ridge. Happily, a bit of airy traversing got me to the summit plateau, where I found a duck apparently pointing to the correct route. Oh, well — whatever works. 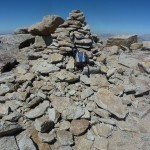 I reached the huge summit cairn 11h30 out, almost an hour slower than I had hoped given my time to Midway. 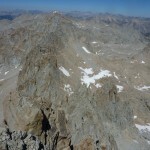 I admired the insanely serrated ridge to Thunder, and examined the north side of the west ridge, one of my possible descent routes. Secor calls it class 4 with an ice axe possibly required. 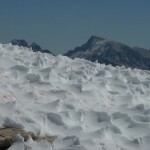 I would normally try such a route, but all the north-facing couloirs had plenty of old snow (and an impressive ice line! ), as well as lingering fresh snow. Going down the south side of the west ridge and around its toe was the only option. I debated heading home — I was behind schedule, and could reach the car before dark — but it looked like only another 1500 feet of climbing to Thunder, and I couldn’t see myself repeating the approach anytime soon. I could still be back in under 20 hours. This part of the day mostly sucked. The chutes down the ridge were all loose scree and talus. Following Secor, I started down a chute close to the plateau, then traversed a few chutes to the right when I could, and was rewarded by not cliffing out. I tried to traverse high around the ridge, but probably wasted time side-hilling and having to descend to avoid cliffs at the foot of the north side. 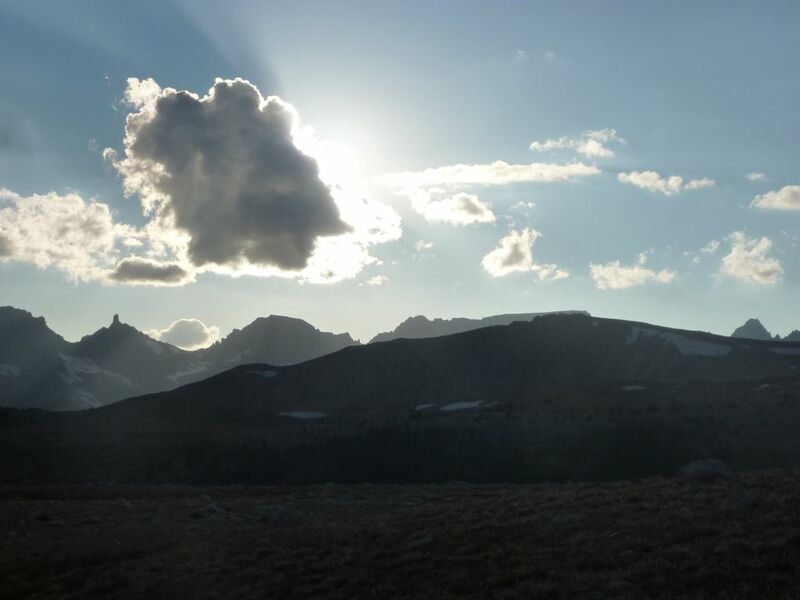 The valley leading to MacLeod Pass on Thunder’s southwest side is a mess of hilly moraines filled with huge talus, so there’s no avoiding a protracted boulder hop; the best you can do is minimize the number of loose-sided valleys you cross. Fortunately, MacLeod Pass is not nearly as bad as Secor claims, with slabs leading up to a point high on the right side, and solid rock or stable talus most of the way up the gully. With a bit of angry music, I made the ridge in good time. 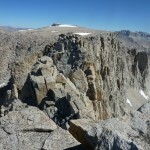 From the ridge, it is easy class 2-3 to Thunder’s interesting summit ridge/block. What looks like the summit is in fact the first of three pinnacles heading north to the true summit. A system of narrow class 3 ledges and a chockstone bridge lead along the right side of the ridge. They’re not hard to find, but quite exposed in places. The summit pinnacle offers two options: a long crack/dihedral to the left, and a delicate step-up plus a big mantle straight ahead. There was a cheater sling in the latter, which I did not use. I reached the summit 13h45 out, again slightly slower than I had hoped. Only one other person had summited this year, and it looked like the peak sees only a handful of summits annually. 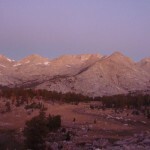 One other person mentioned doing the link-up in 10 hours from the Kern-Milestone trail junction (I had taken 8.5), confirming my belief that this is a reasonable “normal” day from a camp on the Kern. 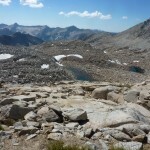 I found a class 3 way off the north side of the summit block and around to the east, then made my way down the long valley to the Kern trail, past much avalanche debris. At one point, the river was funneled off a waterfall into a narrow cleft, which didn’t look like a water-eroded valley; I’m not how it formed. From the trail junction, I traversed cross-country rather than losing 500 feet by following it to the Kern-Milestone junction. While this saved me some climbing, I doubt it saved time or energy, since I wasn’t able to find a level traverse. While I suffered on the climbs going back to Tyndall Creek, I still had energy to jog the downhills and most of the flats. I was impressed at how good I felt 16 hours into the day. 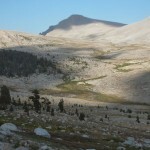 Shortcutting to the Shepherd Pass trail was much easier on the way back in daylight. I continued jogging where I could on the endless, gradual climb to the pass, wanting to minimize my evening headlamp time. 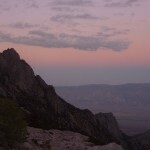 I ran the descent as fast as I could, but still had to put on my headlamp near Mahogany flat. Either my eyes were malfunctioning, or my headlamp wasn’t as bright as I thought it should be. I swapped in my spare batteries, only to find that they were nearly dead. Back on the old batteries, I continued much more slowly than I had hoped. I felt relatively good speed-walking up the dreaded sand hill, but couldn’t see the trail clearly enough to take the downhills at more than a slow trot. With no moon, my vision was reduced to the next 10-20 feet of trail, and the switchbacks down to Symmes Creek were a featureless misery. I remembered that the descent has three segments: a long stretch of pine forest, a short patch of scrub, and a longer stretch of piñon. I tried to gauge my progress by the star-outlined ridge to the north, but it didn’t help. After what seemed like forever moving through the sameness, I reached the stream crossings, which broke the final hike to the trailhead into manageable segments. Other than sore knees, I felt surprisingly energetic and awake for the end of one of my two longest outings ever, 19h45 on the trail. I found a can of chili in the car, and spread it on bread for dinner before crawling in back for a good night’s sleep. Thanks! It was fun to finally get out there. Hmmm. You should have read my summitpost page for Table. We used Secor’s route for the ascent (sucked) but “discovered” a nice stiff class 3 route on the descent that would have got you up in 15 minutes. “discovered” because we found an old hobnail heel at the bottom of our descent route. Um… “ignorance is more sporting?” I knew Secor’s route was useless, but didn’t think to check Summitpost for some reason. I don’t see myself repeating it, but I’ll keep it in mind. btw, I re-read Leor’s account and realized he never climbed Table as I’d originally thought. So just doing Milestone/Midway/Table would have been a first. But then you might not have pushed on to Thunder, so perhaps all for the better! Of course, the next step is to tack Centennial onto the beginning. The current no-snow winter should make the Table-Thunder leg much more direct. Hm… Perhaps Darija should have a project?